Movements seldom win by overpowering the opposition; they win by shifting support out from under it. 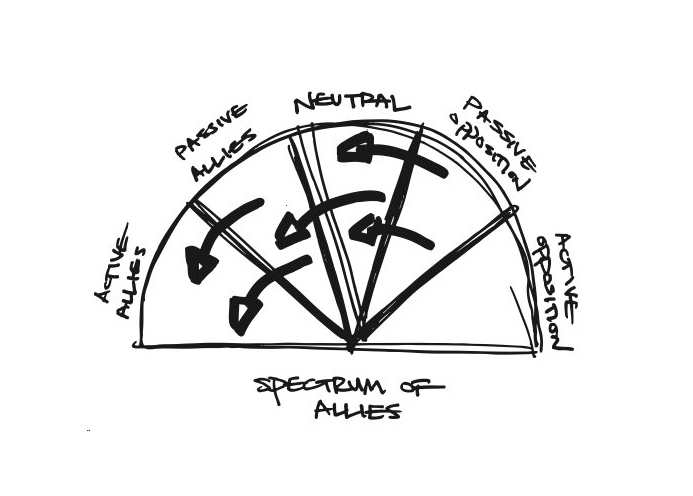 Use a spectrum-of-allies analysis to identify the social groups (students, workers) that are affected by your issue, and locate those groups along a spectrum, from active opposition to active allies, so you can focus your efforts on shifting those groups closer to your position. Identifying specific stakeholders (e.g. not just students, but students at public colleges; not just workers, but domestic workers) can help you identify the most effective ways of moving different social groups closer to your position, in order to win your campaign. When mapping out your campaign, it is useful to look at society as a collection of specific communities, blocs, or networks, some of which are institutions (unions, churches, schools), others of which are less visible or cohesive, like youth subcultures or demographic groupings. The more precisely you can identify stakeholders and impacted communities, the better you can prepare to persuade those groups or individuals to move closer to your position. You can then weigh the relative costs and benefits of focusing on different blocs. Set up a “half-pie” drawing (see diagram). Label the entire drawing with the name of the specific movement or campaign you are discussing, and put yourself on the left side, with your opposition on the right side. active opposition, or people who not only disagree with you, but are actively organizing against you. In the appropriate wedges, place different constituencies, organizations, or individuals. Spend a significant amount of time brainstorming the groups and individuals that belong in each of the sections. Be specific: list them with as many identifying characteristics as possible. And make sure to cover every wedge; neglecting sections will limit your strategic planning and your potential effectiveness. Step back and see if you’re being specific enough. For every group or bloc you listed in the diagram, ask yourself whether you could be more specific — are there more adjectives or qualifiers you could add to give more definition to the description? You might be tempted to say “mothers,” but the reality might be that “wealthy mothers who live in gated communities” might belong in one wedge, and “mothers who work as market vendors” would belong in another. The more specific you can be, the better this tool will serve you. When you come up against the limits of your knowledge, make sure to start a list of follow-up questions — and commit to doing the research you’ll need to get the answers. Watch out for very broad or generic identification of the blocs/groups in the pie chart. Without enough precision this tool won’t help you identify specific communication tactics for reaching particular groups. Nor will you be able to get an accurate read on the true resource costs of reaching those groups. Use this tool to identify the constituencies that could be moved one notch along the spectrum, as well as to assess the relative costs of reaching, educating, or mobilizing each of these constituencies. Do not use this tool to identify your arch enemies and go after them — it’s the people in the middle you’ll most often want to focus on. The groupings or individuals you identify should be as specific as possible: not just unions, for instance, but specific unions. The more specific you can be, the better this tool will serve you.